Toyota strongly urges the use of appropriatechild restraint systems forchildren. The laws of all 50 states in the U.S.A.and Canada now require the use of achild restraint system. Your vehicle conforms to SAEJ1819. If a child is too large for a child restraintsystem, the child should sit in the rearseat and must be restrained using thevehicle’s seat belt. See “Seat belts” onpage 58 for details. For effective protection in automobileaccidents and sudden stops, achild must be properly restrained,using a seat belt or child restraintsystem depending on the age andsize of the child. Holding a child inyour arms is not a substitute for achild restraint system. In an accident,the child can be crushedagainst the windshield, or betweenyou and the vehicle’s interior. Toyota strongly urges use of aproper child restraint system whichconforms to the size of the child,installed on the rear seat. Accordingto accident statistics, the childis safer when properly restrained inthe rear seat than in the front seat. Never install a rear−facing child restraintsystem on the front passengerseat even if the “AIRBAG OFF”indicator light is illuminated. In theevent of an accident, the force ofthe rapid inflation of the front passengerairbag can cause death orserious injury to the child if therear−facing child restraint system isinstalled on the front passengerseat. A forward−facing child restraint systemshould be allowed to beinstalled on the front passengerseat only when it is unavoidable.Always move the seat as far backas possible even if the “AIRBAGOFF” indicator light is illuminated,because the front passenger airbagcould inflate with considerablespeed and force. Otherwise, thechild may be killed or seriously injured. On vehicles with side airbags andcurtain shield airbags, do not allowthe child to lean his/her head orany part of his/her body against thedoor or the area of the seat, frontor rear pillar or roof side rail fromwhich the side airbags or curtainshield airbags deploy even if thechild is seated in the child restraintsystem. It is dangerous if the sideairbag and curtain shield airbag inflate,and the impact could causedeath or serious injury to the child. Do not use the seat belt extenderwhen installing a child restraintsystem on the front or rear passengerseat. If installing a child restraintsystem with the seat beltextender connected to the seat belt,the seat belt will not securely holdthe child restraint system, whichcould cause death or serious injuryto the child or other passengers inthe event of collision. Make sure you have complied withall installation instructions providedby the child restraint manufacturerand that the system is properly secured.If it is not secured properly,it may cause death or serious injuryto the child in the event of asudden stop or accident. A child restraint system for a smallchild or baby must itself be properlyrestrained on the seat with the lap portionof the lap/shoulder belt. You mustcarefully consult the manufacturer’s instructionswhich accompany child restraintsystem. To provide proper restraint, use a childrestraint system following the manufacturer’sinstructions about the appropriate ageand size of the child for the child restraintsystem. Install the child restraint system correctlyfollowing the instructions provided by itsmanufacturer. General directions are alsoprovided under the following instructions. The child restraint system should beinstalled on the rear seat. According toaccident statistics, the child is safer whenproperly restrained in the rear seat thanin the front seat. When not using the child restraint system,keep it secured with the seat belt or placeit somewhere other than the passengercompartment. This will prevent it from injuringpassengers in the event of a suddenstop or accident. Child restraint systems are classified intothe following 3 types depending on thechild’s age and size. Install the child restraint system followingthe instructions provided by its manufacturer. Your vehicle has anchor brackets for securingthe top strap of a child restraintsystem. For instructions about how to use the anchorbracket, see “—Using a top strap” onpage 99. The child restraint lower anchorages approvedfor your vehicle may also be used. See “—Installation with child restraint loweranchorages” on page 101. An infant seat must be used in rear−facing position only. Never install a rear−facing child restraintsystem on the front passengerseat even if the “AIRBAG OFF”indicator light is illuminated. In theevent of an accident, the impact ofthe rapid inflation of the front passengerairbag could cause death orserious injury to the child if therear−facing child restraint system isinstalled on the front passengerseat. Do not install a child restraint systemon the rear seat if it interfereswith the lock mechanism of thefront seats. Otherwise, the child orfront seat occupant(s) may be killedor seriously injured in case of suddenbraking or a collision. If the driver’s seat position doesnot allow sufficient space for safeinstallation, install the child restraintsystem on the rear rightseat. Run the lap and shoulder belt throughor around the infant seat following theinstructions provided by its manufacturerand insert the tab into the buckletaking care not to twist the belt. Keepthe lap portion of the belt tight. After inserting the tab, make surethe tab and buckle are locked andthat the lap and shoulder portionsof the belt are not twisted. Do not insert coins, clips, etc. inthe buckle as this may prevent youfrom properly latching the tab andbuckle. If the seat belt does not functionnormally, it cannot protect yourchild from death or serious injury.Contact your Toyota dealer immediately.Do not install the child restraintsystem on the seat until theseat belt is fixed. 2. Fully extend the shoulder belt to put itin the lock mode. When the belt isthen retracted even slightly, it cannotbe extended. To hold the infant seat securely, makesure the belt is in the lock mode beforeletting the belt retract. 3. 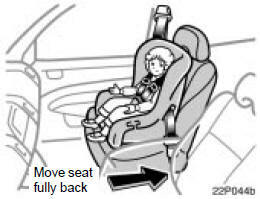 While pressing the infant seat firmlyagainst the seat cushion and seatback,let the shoulder belt retract as far asit will go to hold the infant seat securely. Push and pull the child restraint systemin different directions to be sureit is secure. Follow all the installationinstructions provided by its manufacturer. 4. To remove the infant seat, press thebuckle release button and allow thebelt to retract completely. The belt willmove freely again and be ready towork for an adult or older child passenger. A convertible seat must be used in forward−facing or rear−facing position dependingon the age and size of thechild. When installing, follow themanufacturer’s instructions about theapplicable age and size of the child aswell as directions for installing thechild restraint system. 1. Turn the hybrid system to “IG−ON”. 2. Move the front passenger seat to therearward position. 3. Put the child restraint system on thefront passenger seat without puttingyour weight on the front passengerseat. 4. Insert the seat belt tab into the seatbelt buckle. 5. Fully extend the shoulder belt to put itin the lock mode. When the belt isthen retracted even slightly, it cannotbe extended. To hold the seat securely,make sure the belt is in the lock modebefore letting the belt retract. 6. While pressing the convertible seatfirmly against the seat cushion andseatback, let the shoulder belt retractas far as it will go to hold the convertibleseat securely. 7. Put a child on the child restraint systemand secure the child, complyingwith the instructions provided by thechild restraint system manufacturer. The “AIRBAG OFF” indicator light shouldbe illuminated when the “IG−ON” mode isenabled and the child is in the child restraintsystem after following these procedures.The “AIRBAG OFF” indicator lightindicates the SRS front passenger airbagand side airbag on the passenger side willnot deploy. If the “AIRBAG ON” indicatorlight is illuminated, remove the child restraintsystem and reinstall it with the hybridsystem in the “ACC” or “OFF” mode.If the “AIRBAG ON” indicator light is illuminatedwhen the “IG−ON” mode is enabled,then the SRS front passenger airbagand side airbag on the passengerside may deploy in an accident. Do notdrive the vehicle in this condition. Removethe child restraint system and contact yourToyota dealer. Never install a rear−facing child restraintsystem on the front passengerseat. A forward−facing child restraintsystem should only beinstalled on the front passengerseat when unavoidable. If you mustinstall the child restraint system onthe front passenger seat, put theseat in its most rearward position,and install the forward−facing childrestraint system in the proper order.Otherwise, the front passengeroccupant classification system cannotdetect the presence of the childrestraint system and the front passengerairbag and side airbag onthe front passenger seat coulddeploy, and the impact could causedeath or serious injury to the child. 1. Run the lap and shoulder belt throughor around the convertible seat followingthe instructions provided by itsmanufacturer and insert the tab intothe buckle taking care not to twist thebelt. Keep the lap portion of the belttight. To hold the convertible seat securely,make sure the belt is in the lock modebefore letting the belt retract. 3. While pressing the convertible seatfirmly against the seat cushion andseatback, let the shoulder belt retractas far as it will go to hold the convertibleseat securely. 4. To remove the convertible seat, pressthe buckle release button and allow thebelt to retract completely. The belt willmove freely again and be ready towork for an adult or older child passenger. 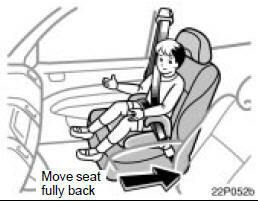 A booster seat must be used in forward−facing position only. 1. Sit the child on a booster seat. Runthe lap and shoulder belt through oraround the booster seat and across thechild following the instructions providedby its manufacturer and insert the tabinto the buckle taking care not to twistthe belt. Make sure the shoulder belt is correctlyacross the child’s shoulder and that thelap belt is positioned as low as possibleon the child’s hips. See “Seat belts” onpage 58 for details. Always make sure the shoulder beltis positioned across the center ofchild’s shoulder. The belt should bekept away from child’s neck, butnot falling off child’s shoulder.Otherwise, the child may be killedor seriously injured in case of suddenbraking or a collision. Both high−positioned lap belts andloose−fitting belts could causedeath or serious injuries due tosliding under the lap belt during acollision or other unintended event.Keep the lap belt positioned as lowon a child’s hips as possible. For child’s safety, do not place theshoulder belt under child’s arm. 2. To remove the booster seat, press thebuckle release button and allow thebelt to retract. Follow the procedure below for a childrestraint system that requires the useof a top strap. Use the anchor brackets on the back ofthe rear seatback to attach the top strap. Anchor brackets are installed for eachrear seating position. This symbol indicates the location of theanchor brackets. 1. Remove the luggage cover (See“Luggage cover” on page 316.) andraise the head restraint to the uppermostlock position. 2. Open the cover of the anchor bracket. 3. Fix the child restraint system withthe seat belt. Latch the hook onto the anchorbracket and tighten the top strap. For instructions to install the child restraintsystem, see “Child restraint” onpage 86. Make sure the top strap is securelylatched, and check that the child restraintsystem is secure by pushingand pulling it in different directions.Follow all the installation instructionsprovided by its manufacturer. The lower anchorages for the child restraintsystem interfaced with theFMVSS225 or CMVSS210.2 specificationare installed in the rear seat. The anchorages are installed in the clearancebetween the seat cushion and seatbackof both outside rear seats. Child restraint system interfaced with theFMVSS213 or CMVSS213 specificationcan be fixed with these anchorages. Inthis case, it is not necessary to fix thechild restraint system with a seat belt onthe vehicle. 1. 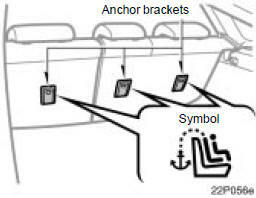 Widen the gap between the seatcushion and seatback slightly andconfirm the position of the lower anchoragesbelow the symbol in theseatback. 2. Type A—Latch the hooks of lowerstraps onto the anchorages andtighten the lower straps. Type B—Latch the buckles onto theanchorages. The symbol on a child restraint systemindicates the presence of a lower connectorsystem. For installation details, refer to the instructionmanual equipped with each product. When using the lower anchoragesfor the child restraint system, besure that there are no irregular objectsaround the anchorages or thatthe seat belt is not caught. Push and pull the child restraintsystem in different directions to besure it is secure. Follow all theinstallation instructions provided byits manufacturer.